IBM Tivoli Monitoring Express Version 6.1 is a powerful, affordable, and easy-to-use availability management solution designed to help small to mid-sized companies manage IT infrastructures. It offers the ability to manage bottlenecks, performance impacts, and outages across heterogeneous environments from a single, centralized portal. IBM Tivoli Monitoring Express V6.1 is easy to install, easy to deploy, and easy to use, providing rapid time to value. It provides real-time and historical data that enables you to quickly diagnose and solve issues with the new GUI through the IBM Tivoli Enterprise Portal component. 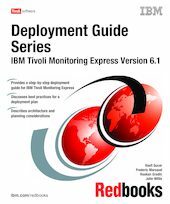 This IBM Redbooks publication presents a deployment guide for IBM Tivoli Monitoring Express V6.1. We describe planning, installing, and troubleshooting IBM Tivoli Monitoring Express V6.1. In addition, we provide some case studies that you can use as part of a proof of concept or a customer demonstration. The target audience for this book is IT specialists working on new IBM Tivoli Monitoring Express V6.1 installations.